Drawing a stroke with the Eraser tool cuts out the stroke from your artwork. An eraser's tip can be shaped like a circle, a diamond or a square, and can be configured to have a specific size, aspect ratio and angle. Also, your eraser strokes can be automatically smoothed by Harmony as you erase. In the Tools toolbar, select the Eraser tool or press Alt + B. In the Tool Properties view, click the arrow button to open the Eraser Properties view. The Eraser Properties dialog opens. Use the Maximum Size slider to set the maximum size of your eraser tip, in pixels. NOTEWhen drawing with a mouse, your eraser is always at its maximum size. When drawing with a pressure-sensitive pen tablet, your eraser's size will range between its minimum and maximum size, depending on the amount of pressure you put on the pen when drawing. If you are using a pressure-sensitive pen tablet, use the Minimum Size slider to set the percentage of your eraser tip's maximum size your eraser should be when you use your pen with very little pressure. If you don't want the pressure on your pen to affect the eraser size, set this parameter to 100%. 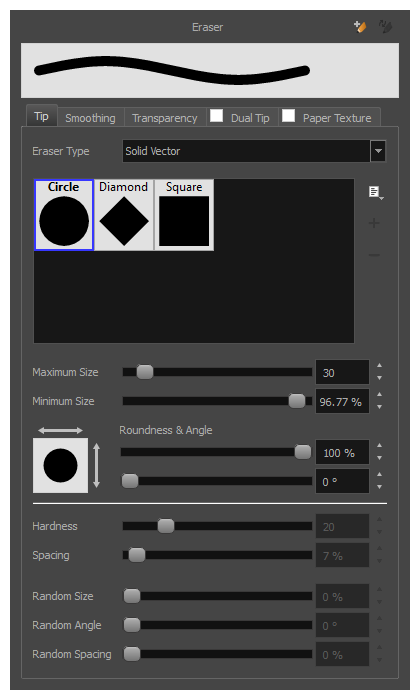 If you want your eraser tip to have uneven dimensions, use the Roundness slider to shrink the eraser tip vertically all the while preserving its horizontal size. If you want your eraser tip to be at an angle, use the Angle slider to rotate your brush tip. Either close or set aside the Eraser Properties dialog. In the Camera or Drawing view, start erasing to test your eraser settings. 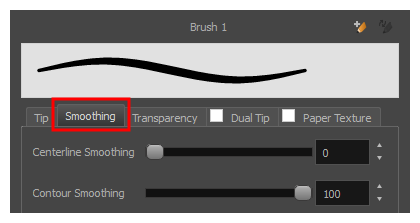 NOTETo learn more about the Brush tool options, see Eraser Tool Properties.